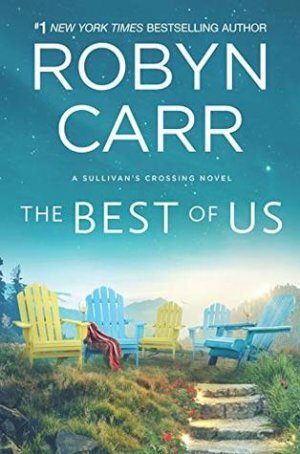 In The Best of Us (Sullivan’s Crossing #4) by Robyn Carr, Since losing her mother before she was school- age, it’s been the dynamic duo of Leigh Culver and her aunt Helen against the world and against all the odds. With her own local medical practice in Timberlake, Colorado, booming and her aunt now a best-selling mystery writer, Leigh couldn’t be more satisfied with leaving Chicago behind for small town living. She’s overjoyed at the thought of sharing the highlights of her new hometown with Helen as she drops in for a visit. Leigh didn’t expect to have her whole world change when she begins to fall for a local business owner shortly after Helen decides to stay for a while. Neither did she expect that her aunt would be going through similar life adjustments when she gets cozy with a gentleman from Sullivan’s Crossing. “I think you’re the best thing that’s ever happened to me,” he said. Former schoolteacher Helen is so proud of her niece Leigh, who is of course more like a daughter to her after she raised her single-handedly when Helen’s sister passed away unexpectedly. The years of hard work and sacrifice were so worth it to see Leigh thrive as a physician and, it appears, to have fallen in love with a wonderful man. Helen, being of a certain age, has been content to focus these days on her writing career and enjoying traveling the world. Who could have ever guessed that she would be so enthralled with Colorado? Leigh’s choice of towns to settle down in wins Helen over right from the start. As does a man with a kind heart and a multitude of local family and friends. Is it crazy to think about romance at her age? Or is this what Helen’s been looking for her whole life? ‘He leaned toward her and gave her a peck on the lips. The Best of Us brought us back to Sullivan’s Crossing and Timberlake, Colorado, just in time to watch people from three different generations each find their HEA. Filled with all the warmth, genuine emotions, and small town charm Robyn Carr is known for in her work, I just couldn’t get enough of this delightful novel. Robyn Carr’s Virgin River series is what drew me back into reading romance on a regular basis about ten years ago and I have cherished every new series and every new standalone she has put out since then. Her Sullivan’s Crossing books have kept me entertained for sure with the many varied characters we’ve met and the beauty of that local area. And each book has had a different feel to it, based on what the main characters were battling in their lives at the time. Unlike some previous books, The Best of Us didn’t have any threads of suspense in it, nor did it have dark, drama-filled scenes that wrecked me emotionally as some of Carr’s work has in the past. This particular story was, yes, about overcoming some odds of course–what book isn’t? But it was a touching tale about family, friendship that turns into something more, and reaching for your dreams while still keeping your feet on the ground. Sounds good, yeah? Watching three totally different generations of characters fall in love in one book was heartwarming, to say the least. Carr did a fantastic job of weaving their romances into this story and showing how they in some cases were a tad influenced by each other. The town’s local doctor, Leigh, her aunt Helen, and Rob Shandon’s teenage son Finn were the lucky recipients of HEAs. (lol) But they did have to earn it. There was some definite soul-searching done, especially by the good doctor, as well as rearranging their plans of what their futures looked like. I loved that Finn, Helen, and Leigh were already solid, down to earth people and that they found equally wonderful people to fall for here. It made it easy to cheer each couple along and to overlook some of the stumbles they made along the way. (Ahem, Leigh!) And I have to mention that there will be one particular scene–one of my favorites–toward the end with Finn and his younger brother Sean that I think fans will *love*. It will have you both laughing and happy-crying with their antics and the emotions behind it. Heartfelt and with a touch of humor, The Best of Us reminded me again why I adore Robyn Carr’s work. If you haven’t started this series yet there might be a few mild spoilers, but you can feel free to jump in with this book and enjoy all that is Sullivan’s Crossing. Sounds great.Love this author.Have read them all.